Abstract parallel particle tracing process. This class implements a particle tracer similar to what is described in appendix 4.A of Eric Veach's PhD thesis. Particles are emitted from the light source and subsequently perform a random walk that includes both surface and medium scattering events. The work is spread out over multiple cores/machines. For every such event,a custom routine is invoked. To actually use this class, you must extend it and implement the function createWorkProcessor(), which should return a subclass of ParticleTracer with overridden functions ParticleTracer::handleSurfaceInteraction and ParticleTracer::handleMediumInteraction. The particle tracer supports two principal modes of operation. Trace a fixed number of particles. In this mode, a specified number of particles will be emitted, and a customizable action is performed for every scattering event. Note that the number of resulting events will generally be different from the number of traced particles. This mode is used for instance by the ptracer plugin. In this mode, the number of particles to be emitted is unknown ahead of time. Instead, the implementation traces particles until a a certain number of scattering events have been recorded. This mode is used to create photon maps. 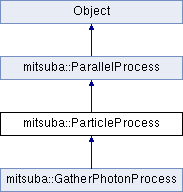 See GatherPhotonProcess for an implementation. granularity Number of particles in each work unit. When set to zero, a suitable number will be automatically chosen.